A little over a year ago, I posted an image of Delta II rocket on its pad to mark the launch of NASA’s GRAIL mission. 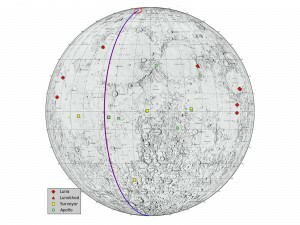 Today, I’m posting a map of the Moon that shows where the GRAIL spacecrafts will hit on Monday (17 Dec 2012). 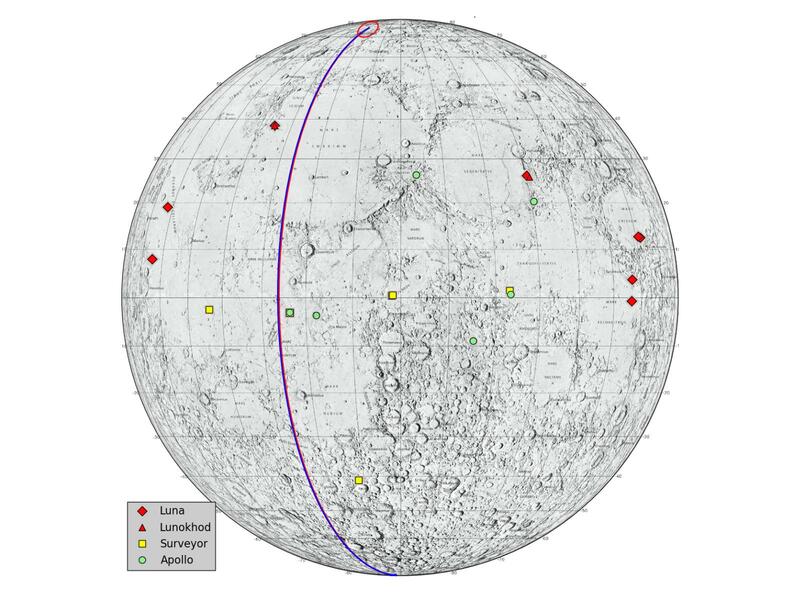 The twin probes were always meant to be disposable; once they’d completed their mission (mapping the Moon’s gravitational field), they were to be crashed deliberately into the lunar surface. NASA could just let “Ebb and Flow” die a natural death, so to speak. The twins aren’t quite empty of fuel yet, but eventually, they would find their own way to the lunar surface. If you chased down the article I mentioned yesterday and read its final section, however, you already know why NASA is reluctant to let that happen. Two words: lunar heritage. Successes of private entities like SpaceX make NASA nervous. It was probably difficult to imagine a real threat to something located on the moon. It’s not so difficult to imagine it today, though. Less pressing, I think, is the possibility that another nation will land on the Moon and lay claim to what the United States and the Soviet Union (Russia) left behind. It may happen, but not before SpaceX gets there. State entities pushing on federal policies. For instance, in 2010, the California State Historical Resources Commission voted to include the Apollo 11 landing site and relics on the California Register of Historical Resources. New Mexico has also laid claim to it as state heritage. This leads to more pressure for Tranquility Base to be named as a National Historic Landmark. Expansion of the nominating criteria/categories for inclusion on UNESCO’s World Heritage List. Tranquility Base has already been nominated for inclusion once on the list. At one time, the list included only architectural monuments. From there it has expanded to include gardens, cultural landscapes, intangible heritage, underwater sites, and natural sites. It’s only a matter of time before World also means Universe. 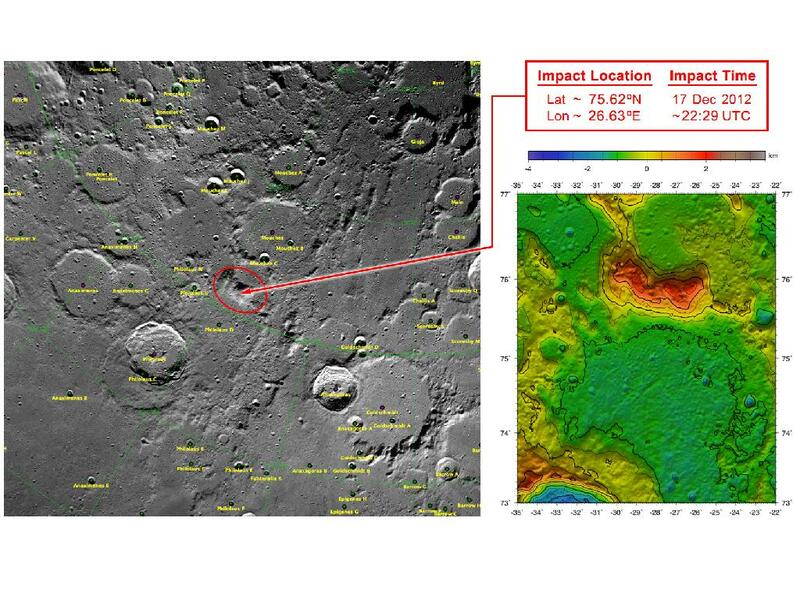 The Lunar Reconnaissance Orbiter Camera has made it clear that there are artifacts involved, not just activity. In theory, the 2008 Convention for the Safeguarding of Intangible Cultural Heritage could be stretched to cover “space exploration” as a significant cultural practice, but significant space detritus is more likely to be included on the World Heritage List. We’ve only begun to talk about the issues at stake—the difference between “space history” and “space heritage,” who owns the Moon, who owns the Universe, why do we keep throwing things away in space. Hopefully, policy will evolve along with our thought processes. In the meantime, I encourage you to track down Launius’ article, which represents some of the current thinking on the subject.